SINBAD is a sweet, calm boy. His favorite things are belly rubs, chin scratches, and sleeping curled up next to his foster mom. He also loves to talk, especially when he is ready to play with his catnip mice. 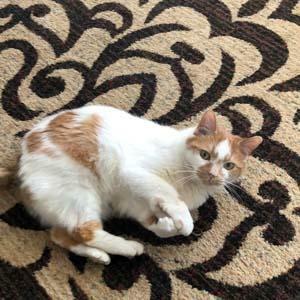 In addition to his purr, you can tell Sinbad is happy when he kneads on you, the couch, or up in the air. 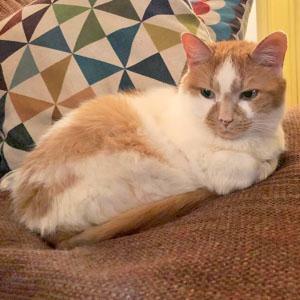 Sinbad needs a quiet home with no dogs or young children. He is a little shy when strangers visit his foster home, but he can't help but reappear to keep his eye on things. He definitely wants attention, and needs someone who is willing to give him lots of petting. We don't know how Sinbad would do with other cats. Given his love for cuddles and for playing with his mice, he may enjoy a like-minded, gentle kitty companion. He is happy, however, as the only kitty as long as he gets plenty of love and affection from his caretaker. Sinbad showed up on the doorstep of a former SPCA adopter. 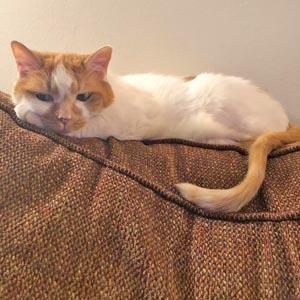 He was malnourished and had an abscessed bite wound at the base of his tail. We don't know if he was lost or abandoned, but he was in very poor condition when he was found. 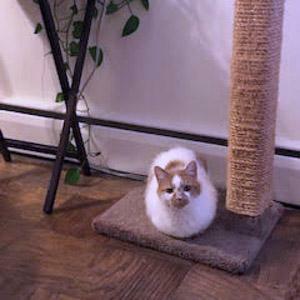 With ongoing vet care, including a dental cleaning, good food and lots of TLC from his foster mom, Sinbad is now a healthy and happy boy who craves a home of his own. PLEASE NOTE: We ONLY adopt to residents of the Washington metropolitan area, which includes Washington, D.C. and parts of Northern Virginia and Maryland. Please see our adoption guidelines at WWW.SPCANOVA.ORG .